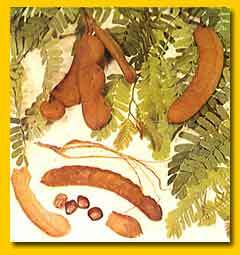 The food uses of the tamarind are many. The tender, immature, very sour pods are cooked as seasoning with rice, fish and meats in India. The fully-grown, but still unripe fruits, called "swells" in the Bahamas, are roasted in coals until they burst and the skin is then peeled back and the sizzling pulp dipped in wood ashes and eaten. The fully ripe, fresh fruit is relished out-of-hand by children and adults, alike. The dehydrated fruits are easily recognized when picking by their comparatively light weight, hollow sound when tapped and the cracking of the shell under gentle pressure. The shell lifts readily from the pulp and the lengthwise fibers are removed by holding the stem with one hand and slipping the pulp downward with the other. The pulp is made into a variety of products. It is an important ingredient in chutneys, curries and sauces, including some brands of Worcestershire and barbecue sauce, and in a special Indian seafood pickle called "tamarind fish". Sugared tamarind pulp is often prepared as a confection. For this purpose, it is desirable to separate the pulp from the seeds without using water. If ripe, fresh, undehydrated tamarinds are available, this may be done by pressing the shelled and defibered fruits through a colander while adding powdered sugar to the point where the pulp no longer sticks to the fingers. The seeded pulp is then shaped into balls and coated with powdered sugar. If the tamarinds are dehydrated, it is less laborious to layer the shelled fruits with granulated sugar in a stone crock and bake in a moderately warm oven for about 4 hours until the sugar is melted, then the mass is rubbed through a sieve, mixed with sugar to a stiff paste, and formed into patties. This sweetmeat is commonly found on the market in Jamaica, Cuba and the Dominican Republic. In Panama, the pulp may be sold in corn husks, palmleaf fiber baskets, or in plastic bags. Tamarind ade has long been a popular drink in the Tropics and it is now bottled in carbonated form in Guatemala, Mexico, Puerto Rico and elsewhere. Formulas for the commercial production of spiced tamarind beverages have been developed by technologists in India. The simplest home method of preparing the ade is to shell the fruits, place 3 or 4 in a bottle of water, let stand for a short time, add a tablespoonful of sugar and shake vigorously. For a richer beverage, a quantity of shelled tamarinds may be covered with a hot sugar sirup and allowed to stand several days (with or without the addition of seasonings such as cloves, cinnamon, allspice, ginger, pepper or lime slices) and finally diluted as desired with ice water and strained. In Brazil, a quantity of shelled fruits may be covered with cold water and allowed to stand 10 to 12 hours, the seeds are strained out, and a cup of sugar is added for every 2 cups of pulp; the mixture is boiled for 15 to 20 minutes and then put up in glass jars topped with paraffin. In another method, shelled tamarinds with an equal quantity of sugar may be covered with water and boiled for a few minutes until stirring shows that the pulp has loosened from the seeds, then pressed through a sieve. The strained pulp, much like apple butter in appearance, can be stored under refrigeration for use in cold drinks or as a sauce for meats and poultry, plain cakes or puddings. A foamy "tamarind shake" is made by stirring this sauce into an equal amount of dark-brown sugar and then adding a tablespoonful of the mixture to 8 ounces of a plain carbonated beverage and whipping it in an electric blender. of some types contains the pigment, chrysanthemin.